One of the key points in Priority 3, intervention 3.2, was to develop and implement strategies for the management of transnational transport corridors and common planning and technological constraints. 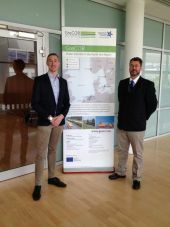 GreCOR addressed exactly this with its overall aim to improve knowledge about the logistic needs and conditions, develop and implement the first green corridor in the North Sea Region in a strategic policy setting. Efficient, economic, safe and sustainable freight movement is essential to everyday life and society in the North Sea region and depends on value-adding transnational green corridors and operations. Efficient logistics provide access to markets, stimulate competitive companies, growth, innovation, knowledge and competitiveness in the region. Better knowledge of freight flows will provide possibilities for more efficient implementation of measures and a sound basis for decision making. The GreCOR project was based on the Green Corridors initiative, launched by the EU and further developed by Swedish national government. Green Corridors aimed at strengthening the logistics industry's competitiveness and creating sustainable solutions that enable large-scale and long-term transport solutions through sufficient and attractive infrastructure and supportive regulatory framework. GreCOR went one step further than other running Green Corridor projects, not only in focusing on the corridor itself, but also on how the transports were being generated from the catchment area around the corridor, and the origin and destination of the transport flows. GreCOR stressed the importance of a transnational dimension of the possibilities and the challenges. Creating green, efficient and financially sustainable logistic solutions is very important for the prosperity of the North Sea Region – it addressed an international problem, which needed international context to be tackled and solved. The approach was co-modal (use of different modes on their own and in combination) and covered all surface freight modes. The GreCOR project was developed on the basis of reliable data with solutions chosen and implemented in partnership with industry, specifically for the freight needs of the individual locations. The area in focus of the project was the wide North Sea region. GreCOR looked at two important parts of the freight efficiency puzzle. The first part had the corridor focus by developing the Green Transport Corridor Oslo-Randstad in the eastern rim of the North Sea. The second part focused on efficient logistic nodes, being in particular studied in the western rim of the North Sea. The two parts depended on each other and learning from one part was transferred to the other part. General knowledge about characteristics of freight transports in corridors and nodes were applicable to other (larger or smaller) corridors within the North Sea Region and beyond. A common strategy for how the green corridor in the NSR should be realised. A new business model to cater the needs of every player in the supply chain to overcome objections and hindrances. A fully functional and working concept of High Capacity Transport Corridor within the Green Corridors Area Oslo- Rotterdam. Testing of a shuttle line for period (12 -18 months) from Randstad to the Nordic part of the corridor.